14 May 1915 - gun shot wound to arm; 18 May 1915 - admitted hospital Malta; 14 Jun 1915 - transferred Advanced Base Hospital Alexandria; 25 Jul 1915 - Floriana Hospital Malta - neuralgia; 18 Sep 1915 - Alderney Military Hospital Liverpool - enteritis & dysentery. Thomas Spencer (born Francis Spencer), fourth son (of 13 children) of Charles Henry & Margaret Bush (nee Brimmell) Russell, was born in Auckland on 15 August 1889. He attended the Union Street and Pine Hill Schools in Dunedin and later trained as a plumber. In 1914, he was working for C. Hodges at Waimate in his trade, and was a prominent sportsman and member of the Zealandia (Waimate) Football Club. He was also Vice President of the Star Ladies Hockey Club, secretary of the Waimate Winter Show Association, a member of the Young Men’s Society and Loyal Valley Lodge. 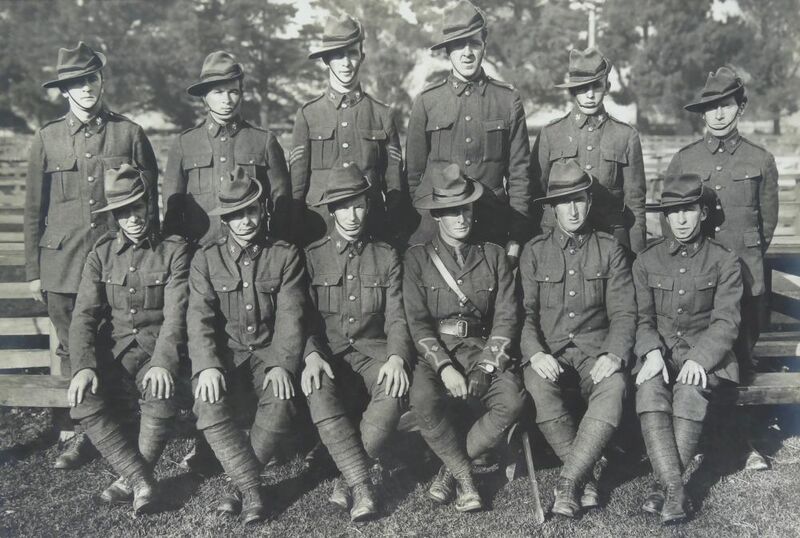 Thomas had previously served two years as a gunner with the Dunedin Naval Volunteers when he enlisted into the Canterbury Infantry Battalion on 13 August 1914. He was described as being aged 24 years, 6 foot 2 inches tall, single, Anglican, weighing 182 lbs, of fair complexion, blue eyes, light brown hair, chest measuring 36 to 39 inches, and as having fair teeth. He gave his father, Mr Charles Russell of Rona Bay Wellington, as his next of kin and his current address as Waimate. He embarked with the Main Body aboard either the Tahiti or Athenic, from Wellington on 16 October 1914, bound for Suez, Egypt. From Egypt, he embarked for service in the Dardanelles on 12 April 1915. He received a gunshot wound to the arm on 14 May and was, on 18 May, admitted to hospital in Malta before being transferred to the Advance Base Hospital at Alexandra on 14 June. June 25 saw him re-joining his unit on the Dardanelles from where, on 25 July, he was admitted to Floriana Hospital, Malta, suffering from neuralgia. While receiving treatment Thomas’s brother, 10/1973 Private George Gladstone Russell, Wellington Regiment, was killed at Chunuk Bair on 8 August 1915. On 18 September 1915, Thomas embarked for England on board the Hospital Ship Oxfordshire and was admitted to Alderney Military Hospital, Liverpool, suffering from enteritis and dysentery. Thomas re-embarked for France on 16 April 1916, and on 1 May 1916, was appointed to the position of cook until relinquishing this appointment on 17 May 1917. A transfer to the Provost Corps followed on 29 June 1917, and he was promoted to Temporary Corporal on 1 October. Granted leave in England, he married Miss Ann Jane Sharp of 106 Robson Street Everson, Liverpool, on 8 December 1917. The Rev R.D. Hutchinson performed the marriage ceremony at St Cuthbert’s Anglican Church, Liverpool. Thomas returned to France with the Provost Corps until being detached to England for duty on 20 October 1918, where he reverted back to the rank of Lance Corporal. On 3 February 1919, he boarded SS Athenic at Liverpool for his return to NZ, arriving home on 21 March. Discharge from the army followed on 17 April 1919, when he returned to Waimate and took up his previous employment of plumbing. For his service of 4 years and 156 days, Thomas was awarded the 1914-1915 Star, British War Medal and Victory Medal. By 1928, Thomas and Ann were living in Wanganui where he was employed as a master plumber, and they were to spend the remainder of the lives there. Thomas became a member of the YMCA and Rotary Club, being president from 1944-1945. During World War Two, he enlisted on 23 January 1941, for service as a Sapper with No 5 Works Company but was discharged on 11 August 1941. He also served as a Wanganui councillor from May 1941 until his death on 6 January 1946, aged 56 years. Thomas and Ann are buried in Plot 351, Block Q, Row 7, Aramoho Cemetery, Wanganui. A son, Spencer Thomas, born at Waimate 5 October 1923, became Governor of the Reserve Bank, and was honoured with a Knight Bachelor in 1988. Another son, Ronald Gordon, later became a very popular mayor of Wanganui from 1974 to 1983, and received the QSO for his services. Both father and son had been presidents of the Wanganui Rotary Club.